Fiji born Sivivatu exploded onto the international scene in 2005 with four tries for the All Blacks against the country of his birth. A specialist left wing, Sivivatu possesses searing pace and an ability to manufacture space in even the tightest of scoring situations. A graduate of Wesley College, the same school in Pukekohe that produced Jonah Lomu, Sivivatu began his career with NPC Division 2 side Counties Manukau in 2002. After becoming the only second division player to be offered a Super 12 contract later that year, Sivivatu graduated to play for Waikato Chiefs and it was not long until the All Blacks came calling. 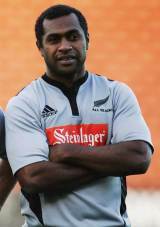 Sivivatu became All Black test cap 1052 when he ran out against Fiji at Albany. There was some controversy around his debut, with New Zealand accused of plundering the Pacific Islands' talent by certain media groups. Sivivatu in fact represented the Pacific Islands against the All Blacks in July 2004, scoring two tries. His second All Black test outing was against the 2005 British Lions, where he scored in the 21-3 first test victory. He repeated the feat as the Lions were routed in the second test, setting up his impressive strike rate of 23 tries from 27 tests. Sivivatu's development at international level led to his inclusion in the touring party to the Northern Hemisphere later in 2005, where he impressed in scoring a scintillating brace in a 45-7 victory against Ireland in Dublin. Following a successful Tri Nations in 2006, during which he notched a try against the Springboks at Loftus Versfeld, Sivivatu and the All Blacks turned their attentions to the 2007 season and the World Cup. Cruising out of their group, with Sivivatu again on the score sheet in games against Romania and Italy, the All Blacks exited the tournament at the hand of hosts France in a tense quarter final clash in Cardiff. Sivivatu notched tries against Ireland and England in 2008's summer Tests and was subsequently a key part of the All Blacks' Tri-Nations victory the same year. He also crossed the line in New Zealand's historic clash with Australia in Hong Kong on the first match of the end of year tour. He would go on to feature strongly against Ireland, Wales and England as the All Blacks completed only their third-ever undefeated tour of the UK & Ireland. Sivivatu was a frequent name on the All Blacks team sheet throughout the 2009 season though New Zealand's Test match with France in November that year proved to be his last for a while. Suffering from a shoulder injury, Sivivatu missed the All Blacks' 2010 Tri-Nations campaign and a knee injury then ruled him out of their Grand Slam winning tour in autumn of the same year. However after a two year absence from the national side, Sivivatu was included in the All Blacks squad for their Test against Fiji in July 2011. He marked the occasion with a try and continued his try scoring form in their win over Australia in Eden Park in August 2011. It is expected, however, that Sivivatu will miss out on the All Blacks tour to South Africa due to a fractured eye socket sustained in their win over the Wallabies.